Social media has matured and your business must be on a variety of platforms including Google+. In less than a year, Google+ grew from nothing to 18.9 million unique visitors at the end of February 2012, according to Compete data reported by Google’s Avinash Kaushik. That’s half the size of Twitter and slightly more than one-tenth the size of Facebook. While Google+ may have lost some of its momentum, it’s still a platform where every marketer needs to be present. 90 million users as of December 31, 2012. Two-thirds male and one-third female according to Google. This makes sense since most social media networks tend to be male, at least in the early phases. 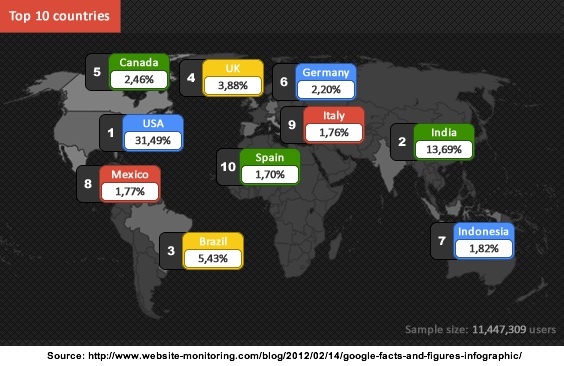 One-third of Google+ users are located in the US. 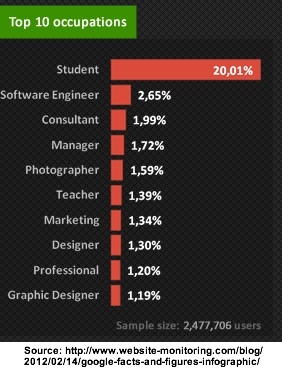 Top ten occupations on Google+ include students, software engineers, consultants, managers, photographers, teachers, marketers, designers, professionals and graphic designers. Brittany Spears has the most Google+ followers (4.5 million) while Lady Gaga clocks in at number 4 (3.8 million). Here are twelve actionable Google+ tactics to get your social media marketing on track. Stake out your Google+ turf. It’s important to separate your business social media activity from your personal social media engagement. To this end, claim your G+ business page because G+ personal profiles are for people only. Business pages allow targeted messaging via circles, multiple administrators and most importantly they’re important for local search. Hook up with Google+. 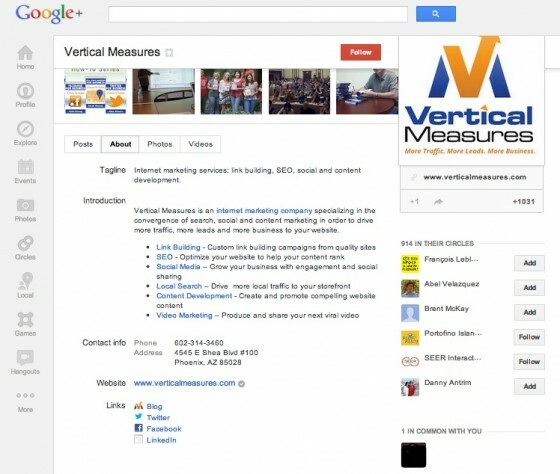 Connect your website with your Google+ page to let Google to know you’re the owner of both properties. It helps Google determine the relevancy of your site in search queries. It also makes you eligible for Direct Connect. Optimize your G+ profile. Like any other social media network, your Google+ profile matters not only on Google+ but also for findability. Use your business name. Describe your business in eighty-five or less words and incorporate the primary keywords. Add photos to your profile that are optimized for search including a description and appropriate keywords. Include links to your presence on other social media venues. Here’s an example of how Vertical Measures has optimized their Google+ profile. Add your Google+ badge to your website. Think homepage. This allows readers to navigate to your Google+ page from your website and lets Google know that this is the website associated with your Google+ account. Place Google+1 buttons on your site. Add the +1 button to every page of your website. For example I have a +1 button on every article on HeidiCohen.com. Feed the Google+ content engine. Like other social media platforms, Google+ requires constant feeding. Get active on Google+. Regularly comment and share content on Google+. Pose questions to get conversations started and jump into ongoing conversations to contribute quality information. Test using an every-four-hour sharing approach. Think morning, noon and evening. Wear the social media jewelry. Include +mentions and #hashtags in your Google+ posts. This is similar to other social media networks. Target your sharing. Instead of posting content for everyone in your circles, share content that’s appropriate for each set of circles, such as customers versus vendors. Engage with your audience. Test Hangouts. You can use them to broadcast live to the public via YouTube. Further you can record and track viewership during the broadcast. After the live event, you can share your hangout via YouTube and Google+. Use this functionality for demonstrations, virtual conferences and company announcements. Test and use Google+ focused tools to support your activity. (Hat tip to Arnie Kuenn for these recommendations at Content Marketing World.) Including:  Build your Google+ audience with Findpeopleonplus.com, Group.as and Circlecount.com,  Schedule your G+ posts with DoShare, and  Track your progress with Ripples. Google+ continues to grow. To maximize its power for your business, you must integrate it into your overall social media strategy and actively participate. These twelve tactics will help you. Have you been active on Google+? If so, what’s your experience been? P.S. I’d be thrilled if you circled me on Google+. 31 Signs you’re still not serious about social media. Tags Arnie Kuenn, CircleCount, Content marketing world, Do Share, FindPeopleOnPlus, G+ Ripples, google+, Group.as, Research. Bookmark the permalink. ← Is Your Blog Driving Readers Away? it to be the base from which all of their other online services operate. begun to include Google+ data that is relevant in its search results. Excellent post Heidi – going to work through these. Thanks so much! Thanks for the “hat tip”. Was good finally meeting you in person at CMW.